The health and safety of men and women working in dangerous environments depends on the protection that Glen Raven’s thermal protective fabrics provide. Two key products in Glen Raven’s portfolio are GlenGuard® FR and GlenGuard® Hi-Vis. These flame-resistant protective and hi-visibility fabrics are suitable for a wide range of challenging working conditions. As a leading developer of fabric technologies, Glen Raven Technical Fabrics manufactures protective and hi-visibility fabrics that meet the exacting requirements of the utility, petroleum and industrial industries. In close collaboration with its customers, Glen Raven consistently delivers innovations in flame-resistant fabric research and product quality. GlenGuard FR flame-resistant fabric offers unsurpassed comfort, protection, colorfastness and abrasion resistance. 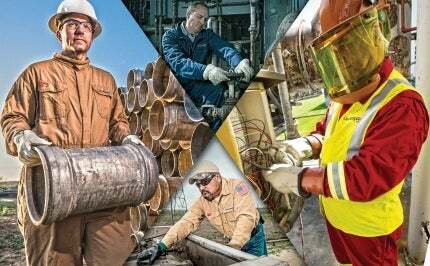 FR coveralls, FR shirts and FR pants produced using GlenGuard FR allow workers to be comfortable without sacrificing safety. Catering to the demanding requirements of the oil, gas, electrical and chemical markets, GlenGuard FR surpasses the requirements of NFPA 70E and NFPA 2112 and is exceptionally comfortable even in the most extreme conditions. GlenGuard’s comfort is derived from the unique aramid fiber that is used to produce GlenGuard FR and our proprietary Wickzz finish. The Wickzz finish applied to GlenGuard FR draws, or wicks, moisture away from human skin and transports it to the surface of the fabric, where it evaporates rather than being absorbed by the fabric and trapped. GlenGuard FR has been extensively tested with simulated flash fire. In controlled tests carried out by independent researchers at North Carolina State University and University of Alberta, Canada, flash fire was targeted at the fabric and measurements taken to determine the extent of the second and third degree burns. The results demonstrated the GlenGuard FR fabric’s superiority in protecting workers from the dangers associated with flash fire and arc flash risks. When it comes down to it, the lower the body burn, the higher the chance of survival. Unlike any other FR garment, GlenGuard FR is solution-dyed rather than piece-dyed. This means that the color is introduced when the fiber is being made rather than dying the fabric after it has been created. FR clothing produced using GlenGuard FR will look nearly new for the life of the garment due to the fabric being solution dyed, not treated, continuously upholding the image of your company while maintaining the FR protection your employees need and deserve. In a vertical exposure test to sunlight, GlenGuard FR out-performed Nomex® in colorfastness. After three months of continuous sunlight exposure, GlenGuard FR maintained its rich color. GlenGuard FR is also strong enough to withstand routine industrial and home washing. Whereas the competition is subject to fading, GlenGuard FR keeps its vibrant color long after 160 washes. The GlenGuard Hi-Vis® line of products offers patented no melt, no drip protection in a hi-visibility vest. When safety standards require employees to be in both FR workwear and hi-vis vests, now there is a solution for enhanced FR safety; GlenGuard Hi-Vis will not melt or drip. GlenGuard Hi-Vis anti-stat fabrics are new additions to Glen Raven Technical Fabrics’ GlenGuard Hi-Vis line of patented protective fabrics. GlenGuard Hi-Vis anti-stat fabrics are used to make high visibility, flame-resistant work vests for jobs that require clothing that meets ANSI 107, ASTM F1506 and NFPA 70-E standards, and that provides static electricity protection to prevent possible ignition of flammable gases that may be present in the workplace. GlenGuard Hi-Vis anti-stat products are available in both mesh and woven constructions. Glen Raven Technical Fabrics has evolved into a worldwide leader of high-performance materials by developing state-of-the-art fabric solutions that create endless possibilities. Our products can be found in a variety of demanding markets and are designed and engineered to help make our customers’ businesses thrive. Glen Raven Technical Fabrics is a division of Glen Raven, Inc. Glen Raven was founded in 1880 and is still a family owned and operated business. Today the three divisions that make up Glen Raven conduct business in 21 countries around the world participating in a wide variety of markets. Some of these markets include: automotive, military, geosynthetic, mining and personal protective equipment. Our globally recognized product line, Sunbrella®, is sold to customers in the furniture and decorative, awning and marine markets. The superior attributes of our many products enables us to meet the needs of more than a few exacting industries, and as the needs of our customers evolve, together we will find innovative solutions that will benefit our businesses. In congruence with our recent rebranding of the GlenGuard FR logo, we are excited to announce the launch of our new website. With excellent protection, durability, colourfastness and abrasion resistance, GlenGuard® fabrics represent a new generation for flame-resistant (FR) apparel. Strata Systems, Inc, a Glen Raven company and manufacturer and marketer of soil reinforcement products, has announced its acquisition of 50% of the equity in Geo Solucões Ltd of Brazil.